Very well suited for private, family, and corporate charters, RENA underwent a major refit in 2010 and is in impeccable condition. She has a wide choice of sparkling new water toys for leisure-time fun (see list below), and WiFi compatibility for access to email and the Internet. Fall/Winter 2016-RENA has just completed another major refit including Exterior Paint, New Carpets and Fabrics throughout the salon, plus other upgrades. 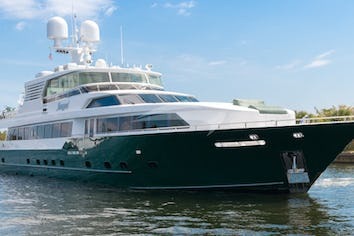 RENA offers an atmosphere of quiet elegance in the full-beam saloon, and open spacious dining room while her many outdoor spaces are wonderful for more relaxed entertaining. The large circular table on the broad covered aft deck comfortably seats 12 for meals, and this is also an especially pleasant place for cocktails. The upper deck, with its grill and bar, plus table and settees, is perfect for cookouts. 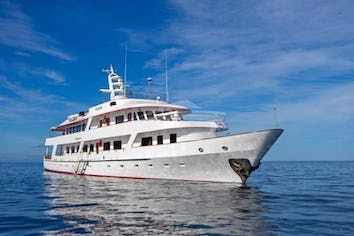 RENA can accommodate 12 guests in 5 cabins. The Master cabin has a king size bed, bath/tub, shower and toilet. 2 Guest cabins have a queen size bed, a single bed, a pullman, bath/tub, shower and toilet. A Guest cabin has a king size bed, bath/tub, shower and toilet. A Guest cabin has a queen size bed, a single bed, bath/tub, shower and toilet. RENA is fully air conditioned through out. Crew has a separate companionway, heads and shower. Born in Australia. Joanne grew up in Auckland, New Zealand. While working within the Professional Photographic field she pursued many leisure activities. Amongst one of her favourites was racing sailboats. This was a passion that she partook in for over 20 years. Racing competitively within the Hauraki Gulf and outer Auckland harbour, her passion for the sea and enthusiasm for travel and adventure led her to a career within the luxury yacht industry. She has visited many ports all over South and North America, Caribbean, Bahamas, Mediterranean, Europe as well as backpacking through Asia, and the Pacific. Joanne has also had extensive experience on busy Charter Yachts; She looks forward to welcoming you on board for a pleasurable and exciting experience. Born and raised in Wales United Kingdom. Justin has served in the Royal Navy for 23 years as an electro mechanical engineer on both submarines and ships. Justin just retied from the British Navy in 2011 and then joined the SuperYacht industry. Justin's hobbies range from restoring old VW Campers, loves live music and occasionally enjoys karaoke. Justin aims to endure you have a trouble free voyage and will make your stay as pleasant as possible. Jess grew up in the sunny Bay of Island of New Zealand. After receiving her Bachelor of Sport and Leisure at Waikato University Jess then set off on her overseas experience. A kiwi surrounded by beautiful beaches her whole childhood it only seemed natural to start a career in the SuperYacht industry. Seven years later she still loves exceeding the guest's expectations! In her spare time, she enjoys dancing, traveling abroad, reading, sports and leading a healthy life style. Julia grew up on the small west coast island of Sweden called Tjorn. She loves the ocean and enjoys all kinds of watersports including lobster fishing, diving and surfing. She competed in show jumping since she was 11 years old, and also enjoys traveling the globe, skiing and reading. She looks forward to welcoming you aboard. Ross is originally from Little Rock, Arkansas. He grew up on the Lakes wake boarding, skiing, also playing baseball. Being on the water is a passion and having a good time comes natural. 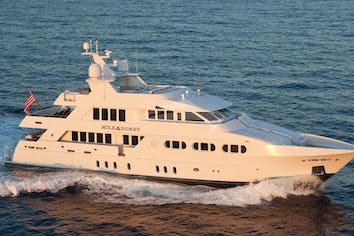 With this Ross made the transition to SuperYachts. Ross enjoys fitness, and drone piloting are his hobbies of interest. He welcomes you aboard!